Time to pay tribute to America’s bravest: Memorial Day is Monday, May 27! Every year on the last Monday in May, we honor the courageous men and women in the armed forces who have lost their lives. The holiday, originally known as “Decoration Day,” was first announced on May 5, 1868, and first celebrated on May 30 of the same year. It began as a day to remember the soldiers who died in the Civil War, but over the years it transformed into a national holiday to memorialize the American soldiers lost in any war. One of the earliest ways to observe the holiday was to wear a red poppy in honor of lost heroes and decorate their graves with flowers, but today we also celebrate with family barbecues, parades and other touching Memorial Day ceremonies. 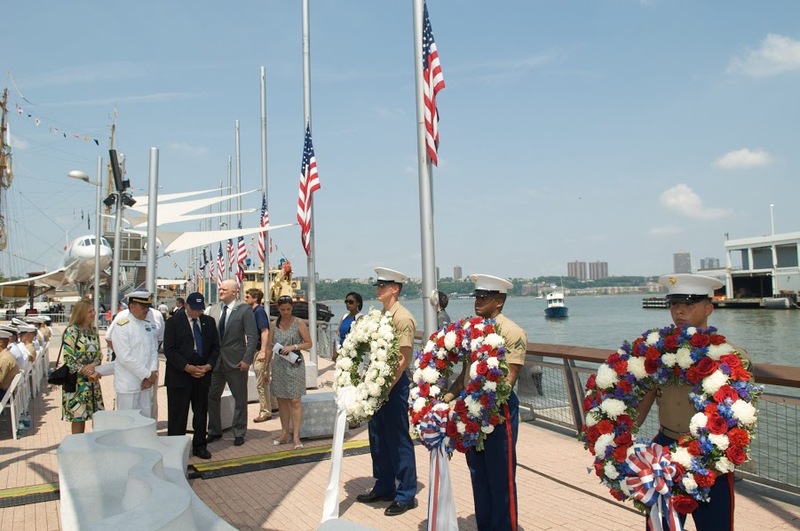 Of the countless commemorative events that are held for the heroes who have made the ultimate sacrifice for their homeland, the Memorial Day Ceremony at the Intrepid Sea, Air & Space Museum is one of the biggest and most exciting in the country. And for almost 10 years, 1-800-Flowers.com has had the privilege of taking part in this historic occasion. As a kickoff to the Summer Salute to Heroes program, the Memorial Day event starts at 10 a.m. with fun interactive displays and hands-on activities along the USS Intrepid’s Pier 86 in New York City, featuring exhibits from the U.S. Coast Guard, Coca-Cola, American Red Cross, CrossFit NYC and more. Then, the poignant Annual Memorial Day Commemoration Ceremony begins at 11 a.m. Visitors can pay their respects to fallen military men and women as they observe the unfurling of a 100-foot American flag and watch as four beautiful Memorial Day floral wreaths are thrown into the ocean from the pier. These stunning wreaths are specially made for, and proudly donated to, the ceremony by 1-800-Flowers.com. They measure more than 30 inches in diameter and are hand-arranged with fresh red, white and blue flowers, such as roses, mums, daisies, monte casino, lilies, carnations, baby’s breath, delphinium and more. The wreaths are then adorned with gorgeous matching bows and set on easels for all to see before they’re customarily released into the water. It’s a tradition that the team at 1-800-Flowers.com is grateful to be a part of for the past decade, and one that we’re looking forward to commemorating for many years to come. The Memorial Day Ceremony is free and open to the public. So if you’re looking for a meaningful way to tip your hat to our fearless U.S. military, visit the Intrepid Sea, Air & Space Museum! You can find more information on the event at IntrepidMuseum.org.